Happy to answer whatever I can. Yeah, can't escape the alphabet soup apparently. Shop around a bit, there will likely be some difference in pricing at various distributors and retailers. There's an internal wastegate version as well which adds more cost, so the v-band / sans-gate housing versions will be a little less. You're right. EFRs are physically large. I also agree that a G series would be great. The only issue is they don't have T3 inlet flanges as far as I know. He could use a T3-T4 adapter (like I do), but I don't know if he likes the idea of that. The only reason I didn't buy a G series (and didn't recommend one) when I was looking for a turbo upgrade was because they only had V band housings at the time. It's a new family of turbine housings and I'm guessing the majority of customers likely asked for v-band; I'd suspect that's why you are not seeing a T3 flange option. I'm not directly involved with the aftermarket products anymore but I have used these same turbine & compressor wheel designs in other projects and can say performance is quite impressive compared to older stuff. I can see how the absence of T3 flange housings would add some complications here though. You can get different lash caps that will fit tighter on the valves. I have a set of CB Performance ones that are incredibly hard to remove. The lash caps/shims that you have may not have a deep enough bore to properly locate on the valve, which will cause issues if there is any valve float or bounce. The cut down triple groove VW valves don't leave enough material past the top of the keeper and create all kinds of issues when setting up the head if you're using a stock base circle cam. I've done it, I don't recommend it. My go-to setup is to use quality single groove VW valves and a KL Racing cam (that uses a reduced base circle). The VW valves, springs, and retainers are all drop in with the reduced base circle cams, no need to cut the spring seats .060" for proper seat pressure. on the lash cap issue. - The lash cap could only be displaced/come lose, if the gap between the valve tip and the inside of the bucket opened up. Otherwise, how would it have ended up not on the valve tip? Stiggy has the numbers, but I think we measured the lash cap at about .080 deep. 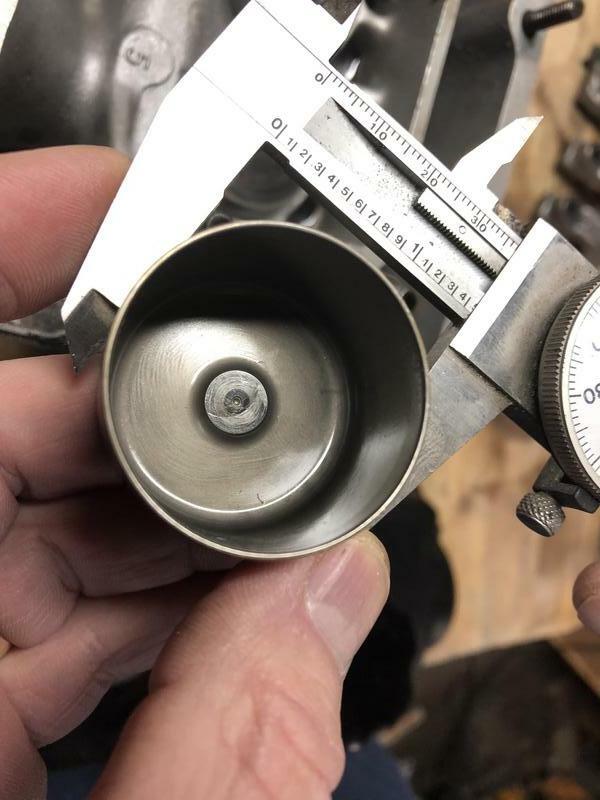 Would have to look at the geometry, but I'm guessing we'd need around half that to get the lash cap off the valve stem. - How does the gap open up? By the bucket losing contact with the valve tip at high rpm as the cam sweeps past tip. Essentially the bucket is "thrown" away from the lobe. - why/how does the bucket lose contact with the cam lobe tip? Because the valve spring is not controlling the valve motion, and at the point where the valve is supposed to change direction (max open) from opening to close, the valve continues to open, the valve gear has now "floated". -why did the valve float? Because the spring is not controlling the valve motion relative to the cam lobe. -what are the possible reasons for the spring not controlling the valve motion? I think this is the real question. Stiggy has had the springs checked previously and was told they met the specs for the heavy springs using stock valves. Need to confirm that is still the case. If the valves that RSI put in the head were heavier than the Volvo valves, then, at least the way I'm seeing it, you would need a heavier spring (one with a higher K) to control the valve motion at the max opening transition point. Seat pressure could still be set at the 95 pound target, but a higher K will give you higher spring pressure when the valve is open. I'm convincing Stiggy to pull an intake and exhaust valve and weigh them. Does anyone have the weight of the stock valves? Which I believe are what these springs are designed to control in high rev environments. Admittedly, I'm no Volvo valve train expert, but I do have a 7.0 L engine that spins at the same 6800 - 7000 rpm, and I have spent way too much time on that valve train. I know that for my car, when you go away from the titanium intake valves or the hollow sodium filled exhaust valves to a heavier (more robust?) all stainless valve, that spring rates need to change or the rev limit has to be reduced. Could this be the same thing on his 2.3? It can also happen with fast ramps on the cam at higher RPMs...especially when bounced off of the limiter. A similar thing happens with cams that have super steep ramps when people try to use them with stock buckets...they kick the shims off of the top of the bucket. Furthermore, while minimal, you also have to take into account an oil film which ends up on the whole valvetrain and does not help the situation. I agree 100% with this. In this case it certainly appears the spring pressure is not strong enough to prevent the cam follower from separating from the lobe surface. And the higher inertia generated by a heavier valve (if that's the case) needs to be overcome by more spring force. 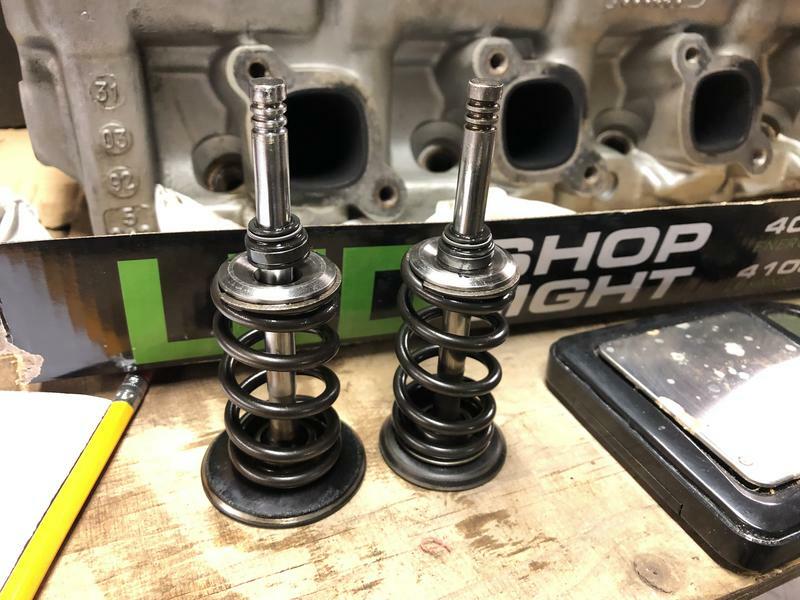 And not only do the valve weights need to be compared, the combined weight of the stock valve with the stock follower/shim assembly needs to be compared to the new valve and follower assembly that's in there. Absolutely agree, the cam profile should be decelerating the valve prior to the valve reversing direction. The RSI cam lobe is very "pointy" compared to the cams I typically deal with, which means they're spending less time decelerating the valve, which in turn means the spring has more momentum from the valve system to overcome. Valve speed is directly proportional to RPM, so high RPM becomes the issue. Force is not proportional to RPM, it's going to be squared. Relatively small changes in RPM are going to have a big effect on force. Agree 100%, it's the mass of the valve train that is being countered by the spring. Don't understand where that comes in to play, can you explain? Good conversation, glad I got the right people engaged. This will be a good learning experience for me to take forward. It looks like this will see me getting pretty involved with the head. If that nets me a reliable and higher quality piece all the better. It's tough considering the money I laid out for the head, but no reason in stressing it at this point. I've heard the advice on the valves, and it's been on my mind since I first bought it and spoke with Pat. iirc, the buckets should actually be supertech units...the question is whether they are the type meant for lash caps or the proper ones with the recess for 8mm shims in them. Looks like the former. The buckets have a raised pedestal which matches the lash caps, no recess for a shim. We had the buckets as an OD of 1.454", height of 1.023"
The depth of the lash cap lip, pertinent to the float convo, is ~.103"
The lash caps are around .181" in total height with minor variation, so appears the top of the lash caps were machined to get clearance specs. 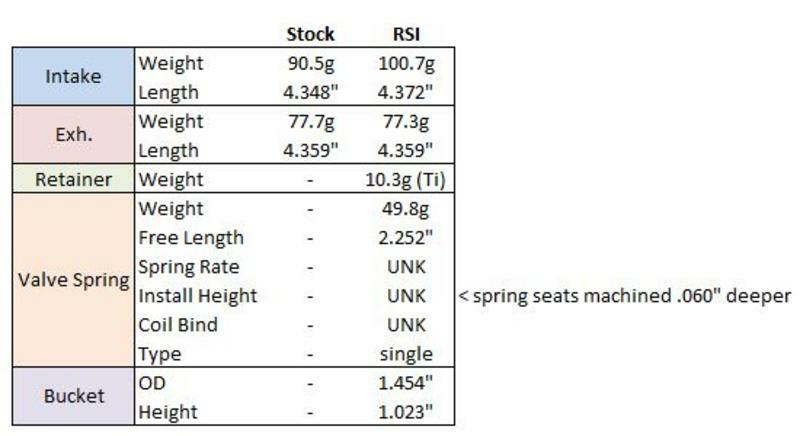 Spring seats are cut, that ship sailed in 2011 when RSI had the head machined. We're going to try and drop a pair of valves tonight to see what I've got in there. Re: the cam - as I think we all know the RSI Stage 3 cam isn't a well known quantity. My current thinking is to ask the machine shop to get a real profile off of it. If I have to, I'll move to something different. My plan is to fix it right, and make the head better than it was new. Whatever that takes, we'll figure it out. Can you tell me the height of the stock bucket without a shim compared to that 1.023" height? The reason I ask this is I saw the reference to Supertech buckets and I should say something. Years ago I put together a big 2-valve head with Ferrea valves and a ton of port work (work was done by Peter Linsson at MVP) and then another person talked me into going the Supertech bucket route with custom top hats. I never got to actually installing that head and later sold it to the guy who talked me into the Supertech buckets. The Supertech buckets I recall were SHORTER than the Volvo buckets, which seemed ok since he was going to run a pretty tall cam. I don't recall the measurements now. After he got it running the engine shredded the timing belt. He replaced the belt and couldn't find the problem until after it shredded the second belt. It turned out the problem was the SHORTER buckets in combination with a custom cam that had a slightly shorter baseline. As the buckets came up to the top, there was not enough skirt in the bore to keep them aligned and a bucket jammed and stopped the cam. After the second incident he went back to stock (taller) buckets with a little machined off the bottom and it was fine. If yours hasn't done THAT, you're probably ok.
Last edited by dbarton; 01-10-2019 at 05:35 PM.. I have to see if I still have a complete stock head loose in the shed, I had the same thought (also wanted a stock bucket and shim to bring to the machine shop for reference). If I can find one tonight I will post it up. Yeah. It took a few hundred miles for that jam to occur each time. Strange that it took that long. I was sorry that happened to him, but relieved it didn't happen to me. My RSI head has the same buckets but has lash caps instead, have bounced it off hard rev limiter at 7k without issues so far. Are the shims varying thicknesses on yours? The lash caps in mine all have the same effective thickness. I emailed SuperTech a few months ago about getting 8mm lash caps in varying thicknesses, but they said they only offered varying thicknesses on the 8mm shim versions (not the lash caps). Maybe you'll get a different story if you talk to them on the phone though. At the time I was looking into swapping in a different camshaft, so I needed some slightly thicker caps at two sizes to get the clearances correct. Dave B - wasn't able to easily get a stock bucket in hand. I might dig into a spare block this weekend to get the data point. If anyone else has easy access and knows how to measure things properly I'd definitely appreciate an assist! Thanks for weighing in. You might have misinterpreted my last post, as it sounds like you and I have the same setup - I only have lash caps and buckets as well, no shims. I did not have a mic to measure the effective thickness, but we measured overall height of the shim (inclusive of shoulder) and found some small variations which we took as an indication the lash caps were ground to adjust clearances. Don't know that for sure, but there's no other way to adjust lash with the way it's set up. Last night we pulled valves from the effected #1. Both the intake and exhaust had sharp edges rolled up on the top edge of each keeper groove, such that we had to file/dremel it smooth in order to pass it through the guide. The valve tips looked good and were not deformed. I've made the decision that I will not be re-using the valves. Other than the sharp edges on the valve everything looks OK.
Below is what I was able to get for data points last night. Anyone got any of the blanks available?? I spoke with Larry's and like the 'vibe' from them as a shop. They're alert, interested, taking the time to listen etc. They did give me a gentle caution that their shop rate for custom work is $145/hr and I might want to do as much research and procurement as possible before bringing the head down. I'm going to take that advice and set about getting as much of this understood and planned as possible ourselves. - First step is to get on the valves. Will make calls to Ferrea today and see where that takes me. - There's a formula in here for the valve springs that we don't have, and the cam is a factor in that equation and I have jack **** for cam data. - Thought for me right now is get valves in hand, buckets in hand, shims in hand, then get it all down to the shop so they can spec it all out, spec the cam, figure out springs with me and bring it all home. I'm finding some positive in all of this. I bought the head complete and just put it on, now I have to build it out and as a result will have a much better understanding of the general principles and also what I'm working with. I'll have more confidence in the setup, and i'm hoping something that is even better performing. And on the side burner we have the turbo. Again a similar thing, I just bought the Holset and ran it. It was "good enough". I want to move on to something that's been thought out to be part of this system, and better matched to the car and it's purpose. I have a lot of research to do here, and I think I'd like to get a turbo in my hands by next month to start planning that work out. Lot of money coming, and not really a reinvestment in the car I was planning on. BUT I think it's really going to make a difference and I'm excited to get into it. I had a very productive lunch break, ran out to our local machine shop to have them weigh in on the head as well. Good conversation and lots of food for thought. I'm going to poke at you guys a bit as to why you're pushing to get rid of the lash caps? I see lash caps of varying thickness listed on the Supertech website, so I don't see what I stand to gain by going to a recess and a flat shim. We looked at the lash cap on the valve in the shop and he said it was a good fit, and there were no inherent issues with the caps or their relationship with the valve stem. My opinion at this point is that my issue was due to the valve springs and insufficient pressures. The lash cap hung the valve open, but it did so because I was floating or bouncing the valve enough to ALLOW it to dislodge. With proper spring pressure and proper lash it's effectively impossible for the lash cap to become dislodged in this way (I think). I'm all ears, but this is what I'm seeing with my two eyes. I have no attachment to either setup, but I want to spend my money wisely and where it's needed. I'm looking at the recess and shim as the inverse of a lash cap, so what's to prevent the exact same thing from happening except it's just a shim popping out instead of a lash cap? SO I think I have a game plan. I'm going to decide on the buckets, source them, and then go down the path of procuring valves. I'll then work with one of the two machine shops on the assembly and spring combination. This is where my local guy has heartburn over the lack of cam info, as he wants that information to determine what springs to use. - has anyone run custom Manley's in their car? - does ANYONE out there have real grind info on the RSI cam? The only info I have is some generic specs for it and I am working off of slightly hazy memories as well. 12.5mm of lift, 240 @ .050" duration, 107 LSA. Also, I am pushing to get rid of the lash caps as I have seen this exact issue before with the same parts and the solution which worked was to use the puck style shims of proper thickness rather than lash caps. Furthermore, you also get a lot more variety in shim thicknesses using them rather than the 2 different thicknesses of lash caps you can get. 10-4 on the lash caps. I definitely take the firsthand experience as valuable, just trying to understand this as thoroughly as I can, and understand why I'm making the various decisions. Senior talked with a friend of his who races BMW's and got a name of someone at Supertech, so have some phone calls to make. Also, I look at high revving OEM setups and what they use...none use lash caps really (my Ducati did, but that also is a desmo setup so it doesn't count). BMWs all use puck style shims for the M motors, the lexus ISF uses different thickness buckets, all high performance (moto-x/enduro racing/Japanese 4 cylinders which spin to a brazillion RPM) bikes use puck style shims (aside from older KTM RFS motors which use eccentrics). My friend at the shop during lunch referenced Subaru as using varying bucket thicknesses as well (not that that is a high revving application). I have pretty limited experience here (my dirt bikes are two strokes..) so I'm learning learning learning. 2T bikes don't give me the engine braking I like on a supermoto track....plus, Husaberg's motto was "4 stroke force" anyways. Ok. This tells me you DON'T have the same Supertech buckets that I had, since mine were shorter. So I would not be concerned with the potential issue I brought up. And of course one of the major benefits of using this type of cam follower. Less valvetrain weight that can be controller by lighter springs than a heavier valvetrain. The other major benefit is a wider flat friction surface area on the top of the bucket than the stock bucket with a shim, since the stock bucket usable top friction surface is reduced by the recess wall. That wider top provides more surface for a high lift cam if desired, that would otherwise be limited by the smaller top surface. Going with shim under bucket should be pretty easy, you'll just have to either find a spring retainer that has the provisions to hold the shim, or have some made. 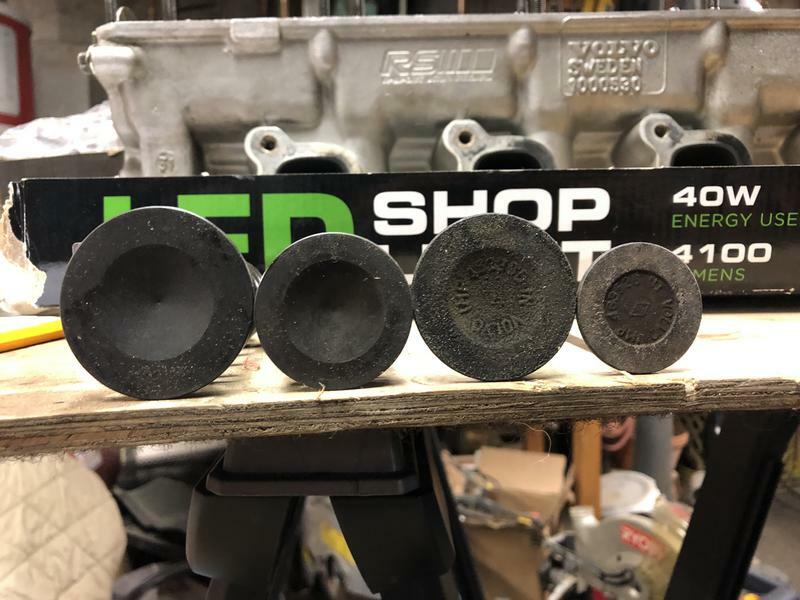 There are a lot of motorcycle engines that use shim under, and the shim kits are relatively inexpensive from Hot Cams and other suppliers (usually around $100). You can also shim the current valve spring to increase the "seat pressure" and spring force, but this has limits wrt to cam lift. At this point the world is my oyster. I’d like to manage costs but I’m in it, so all decisions and options are open. We've now spoken with a couple machine shops, read a LOT, and spent a few lunch breaks together doing napkin math and talking theory. We then called Ferrea yesterday afternoon and had an EXCELLENT conversation with one of their tech guys, John Verburg. It was a shockingly good phone call actually, John spent probably 45m on the phone with us talking specifics, theory, manufacturing, supply chain... it was great. He also listened and paid attention to what I was telling him happened, what the setup was etc. Very impressed, and the talk helped connect a lot of dots in my head around my new learning on valvetrain. John offered me what I was really looking for, which is someone who understands all of the engineering we are working to understand and is interested in a data-driven solution. Another way to put that is we are really good at over thinking and over engineering the hell out of things, and John is willing to nerd out with us about it instead of just telling us to throw more spring at it. At face value John thought my spring pressures made sense (90 closed, 205 open). The part of the convo that really interested me was his explanation of spring harmonics and the follow on discussion about valve speed, bounce and stresses experienced particularly when hitting a rev limiter. He was big on spring material and also getting the spring to within a couple mm of coil bind to reduce harmonics (we also started talking double springs etc.). One thing I feel pretty sure of is that RSI did not put this much thought into it when they put this thing together.. I think my failure mode was the valve bouncing off the seat during the violent spark cut. Root cause likely a combination of improper spring for the application and excessive lash on the #1 exhaust valve. I'm going to be sending a pair of 'stacks' to Ferrea (valve, spring seat, spring, retainer, keepers) for evaluation. I'll be working with John on a custom package solution built around what we determine we want for valves, no half measures. It seems like a good possibility that all of that stack might change, but will reuse parts where it makes sense. TBD if the actual head work (seats and guides) was good and I don't need to re-do that. I might get into the guides anyways depending on what we end up with for valve stem size compared to what I had. No one really picked up on it but my first measurement had the intake valve .013" longer than the exhaust, which makes no sense. I'm going to drop another pair of valves tonight and see how those measure out. Will be interesting to find if that's the exhaust being beaten down, the intake length being a mistake, or perhaps the intake valve being cut LONGER to compensate for the seat being in the wrong place. Should get my valves off to Ferrea tomorrow, and they said it should only take a couple weeks to spec out the package. It's not going to be the cheapest option, but I think it's the best path. 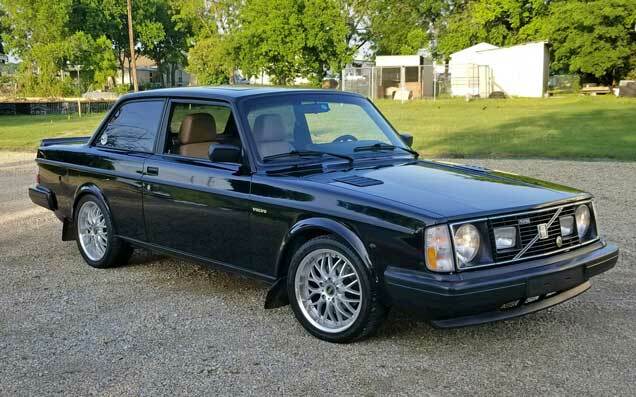 FYI Ferrea does not have any stock or reference data for old Volvo's - it's all custom work. they should have something... they will be custom one-offs for price and availability, but we (well, pat actually) sent them a complete slice of a 530 head a few years ago for them to design the valves. Furthermore, its been a bit of a known that, while they work, the VW springs are not really right for the application. I also missed the part about excessive lash on #1...that definitely did not help the situation.